Antimicrobial peptide Ltc2a on the surface of the bacterial membrane. Insertion of the peptide leads to membrane destabilization and water penetration into the bilayer. Membrane processes are important for a normal function of living cells. Most of the features of a cell membrane are determined by a lipid bilayer, which presets complicated and heterogeneous association of molecules malleable for external agency. Also, it modulates function of membrane and membrane-active peptides and proteins. Therefore, studies of protein-membrane interactions represent an intriguing challenge in the field of structural biology. To get the overall picture of the action of membrane systems (including atomic details of interactions) employment of experimental methods only is often insufficient. Application of high-performance multiprocessor computational facilities permits investigation of different membrane systems using molecular modeling techniques. Among them, molecular dynamics (MD) is one of the most powerful methods. MD simulations of explicit water–lipid systems are successfully carried out in the Laboratory for several years. As a result, a large set of model bilayers and micells differing in lipid composition have been elaborated. 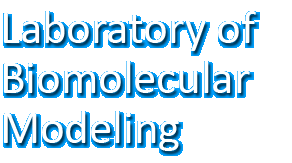 Such models are used to study different classes of membrane-active proteins and peptides (toxins, antimicrobial, Trojan and fusion peptides etc.). In spite of obvious limitations of current MD time scale (~10−7÷10−8 sec), the results of membrane simulations are capable of giving a realistic picture of action of such systems. For instance, essential structural and dynamic characteristics of model membranes lie in a good correspondence with the experimental data. (see fig.1 / table 1). Fig. 1. Equilibrium structures of dioleoylphosphatidylserine (DOPS) and dioleoylphosphatidylcholine (DOPC) bilayers obtained from MD simulations (~15 ns). Systems: 128 lipids, ~5×103 water molecules; 128 Na+ (for DOPS). Lipids and Na+ ions are shown with sticks and spheres, respectively. Nitrogen, oxygen and phosphorus atoms are marked. Water molecules are removed for clarity. For details see Polyansky et al., 2005 (J. Phys.Chem.). Table 1. Equilibrium macroscopic averages for DOPS and DOPC bilayers: MD simulations and experimental data. *  Description of parameters: AL  average area per lipid molecule; Dp-p  average bilayer thickness (distance between peaks of electron density for phosphorus atoms); Scd  average value of order parameter for acyl chains. **  Petrache H.I. et al. Biophys. J. 2004, 86, 1574 (see @ medline). Comparison of simulation and experimental results (fig. 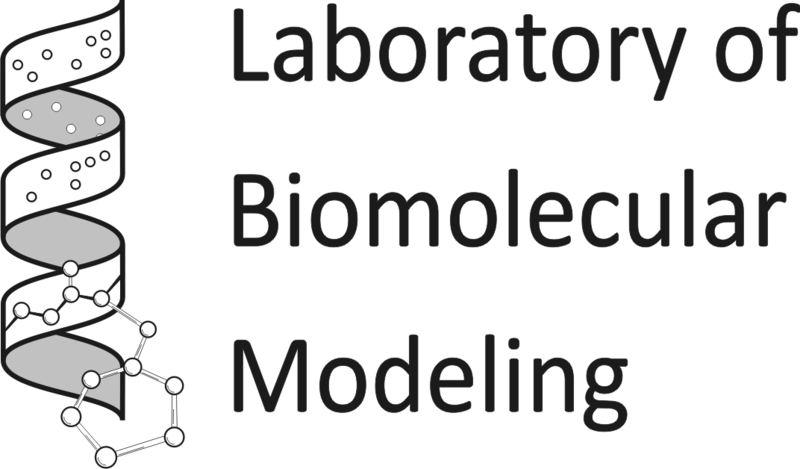 2) permits validation of elaborated models and applied modeling approaches, which are currently used in our studies of new biologically relevant membrane peptides and proteins. Fig. 2. 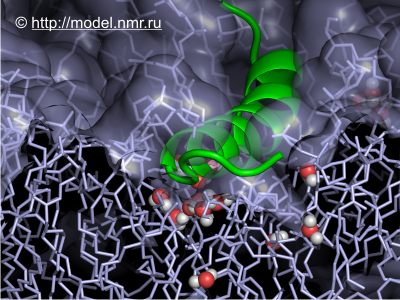 The structure of antimicrobial peptide Ltc2a in sodium dodecyl sulfate (SDS) micelles was determined independently by 1H-NMR spectroscopy in the Laboratory of Biomolecular NMR of IBCH RAS (Dubovskii et al., 2006, PDB-code: 2G9P) and by MD simulations (20 ns). In both cases micelles contain~60 molecules of SDS. The structure of Ltc2a established via MD simulations agrees well with the 1H-NMR data. According to the experimental and simulation results, the peptide consists of two oblique helices connected by a flexible hinge. Peptides helices are given as cylinders. Residues are shown in stick representation and colored as follows: basic  blue, polar  green, hydrophobic  white. For details see Polyansky et al., 2007, JBCB  in press. Further reading  full-atom membrane and membrane mimics models.